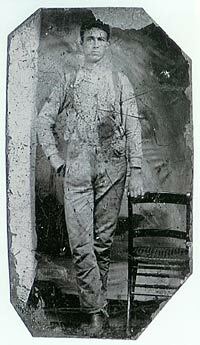 A old tintype of Richard. Richard Henry Fortune was born April 12th, 1865, just three days after Lee's surrender ended the Civil War. In 1886 he married Lucy Margaret Downey. Tradgically, he died in a train accident in 1901. Winston Fortune c.1813 - ???? Sarah Mary Jane Banks 1823 - ???? Last modified on 7 June 2004 by Bradley James Wogsland.